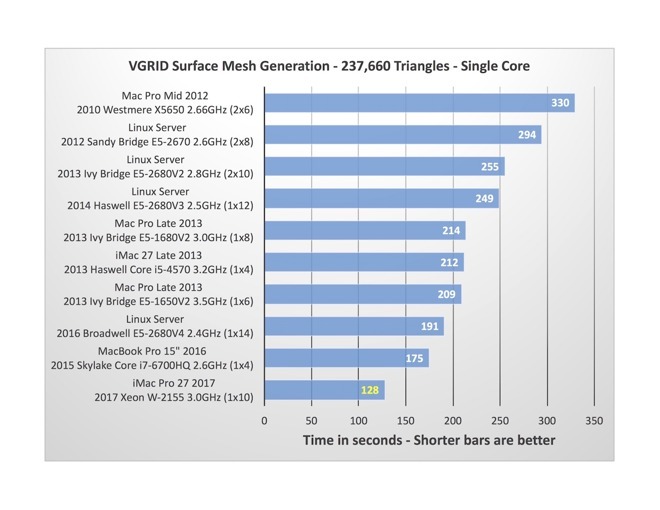 Two more iMac Pro impressions have been posted, with benchmarks from both showing massive gains in processing power in the iMac Pro over older models —plus the inclusion of AVX-512 vector processing optimization in the W-series Xeon processor giving an added push to properly optimized apps. The first set, published on Tuesday by Theodolite developer Craig Hunter, is with the same configuration that Apple provided to YouTube channel MKBHD —a 10-core iMac Pro with the W-2155 Xeon processor running at 3.0GHz, 128GB of RAM, the Vega 64 GPU, and 2TB of flash storage. Performing a computational fluid dynamics study, used in aerodynamic design and development on a single core, the iMac Pro completed the task in 128 seconds, with the 2016 2.6GHz MacBook pro knocking it out in 175 seconds, and the late 2013 Mac Pro with a 3.5GHz processor completing it in 209 seconds. When a flow simulation is performed on multiple cores, the performance advantage the iMac Pro has only gets wider. In Xcode, Hunter saw reductions in compile times of apps with 20,000 to 30,000 lines of code spread out over 80 to 120 source files falling between 30 and 60 percent, when compared to the 2016 MacBook pro, and a 2013 iMac. He notes that there are still bottlenecks in the time it takes to fully deploy an app while installing and launching the app on iOS —but the iMac Pro "makes a pretty noticeable improvement in repetitive code-compile-test cycles." The W-2155 supports AVX-512, and the iMac Pro is the first Mac to support the wider vector registers. As a result, it gets a big boost in non-scalar calculations, where each instruction is run one at a time, versus multiple calculations in the same instruction. 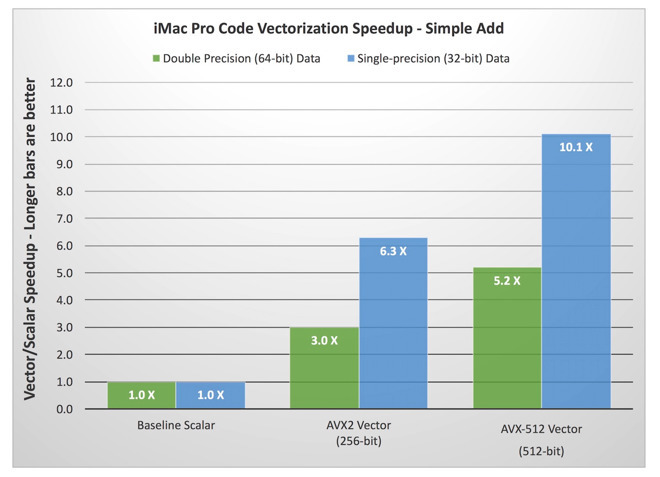 Hunter notes that Intel's Math Kernel Library is optimized for AVX-512, and says that he's been told that Apple's Accelerate Framework has been optimized for it as well —but AppleInsider couldn't confirm Apple's optimizations. When used in comparison with a 2017 iMac with a 4.2Ghz quad-core i7 processor, Hunter obsserves that the faster clock speed in the iMac edges out the iMac Pro in single-core operations —but is completely blown out of the water at calculations involving more than four processors. Additionally, with calculations that use AVX-512, the iMac Pro "runs away" in performance. Videographer Vincent LaForet also was also granted an iMac by Apple for early testing, with his work more or less focused on scientific calculation. One test involved 10.96 GB of 4K, H.264 footage being transcoded to ProRes 422 in Final Cut Pro X. The iMac Pro completed it in 7 minutes and 56 seconds, with a 4GHz iMac 5K with 32GB of RAM knocking it out in 15 minutes and 47 seconds. Using DaVinci Resolve, one hour and 17 minutes of RED 8K Helium at 60 frames per second was exported to ProRes 422 in 2 hours and 6 minutes on the iMac Pro, and 7 hours and 15 minutes on the iMac. With Lightroom Classic, LaForet imported 50.74GB of RAW images, with the application building 1:1 previews. 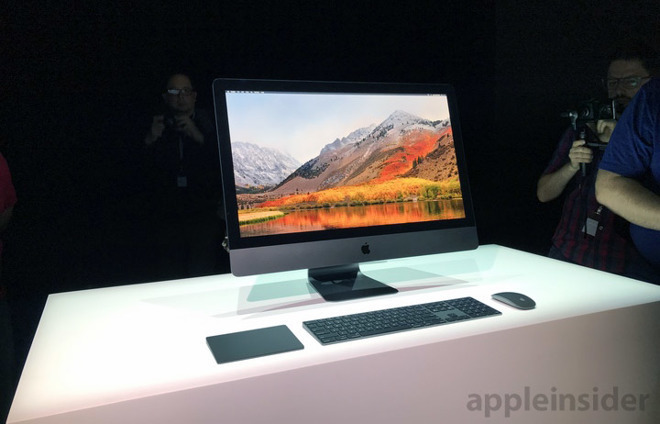 The iMac Pro completed it in 25 minutes and 26 seconds, with the iMac taking twice as long at 50 minutes and 45 seconds. BlackMagic's disk speed test found that the drive writes at 2996MB/sec, with a read speed of 2450MB/sec.